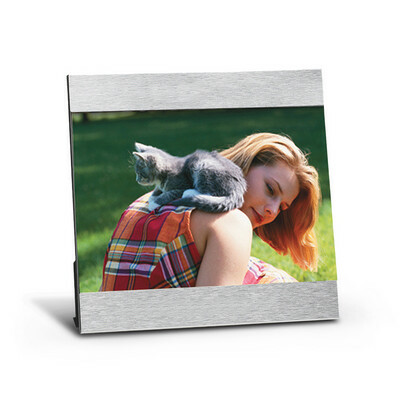 Description: This smart and simple designed photo frame. Features: Photo size 90mm(h) x 140mm(w). Engraves: Silver. Packaging: Wrapped in tissue paper in a polybag sitting in a black moulded insert and presented in a plain black 2 part gift box Packaging Size: 242mm(h) x 190mm(w) x 30mm(d). Colour: Silver. Material: Metal with nickel plating. Product Size: 200mm(w) x 150mm(h) x 8mm(d). Decoration: Pad Print, Engrave. Decoration Area: Laser: 40mm(w) x 15mm(h), Pad: 60mm(w) x 20mm(h). 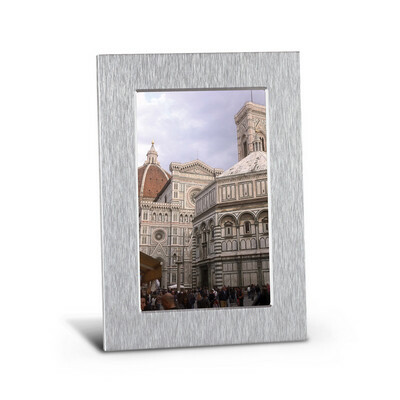 5' x 7' (127 mm x 178 mm) aluminium photo frame that laser engraves to a Natural etch. A lead time of 10-15 working days applies to this product. Colours: Silver. Dimension: W 165mm x H 216mm. Print Description: Bottom - 89mm x 12.5mm (one colour). Print Type: Screen Print. Packing: Gift Box. Less than minimum quantities are not available for this item. MOQ applies per colour on this item. 4' x 6' (102 mm x 152 mm) aluminium photo frame that laser engraves to a Natural etch. A lead time of 10-15 working days applies to this product. Colours: Silver. Dimension: W 152mm x H 152mm. Print Description: Bottom - 127mm x 16mm (one colour). Print Type: Screen Print. Packing: Gift Box. Less than minimum quantities are not available for this item. MOQ applies per colour on this item. 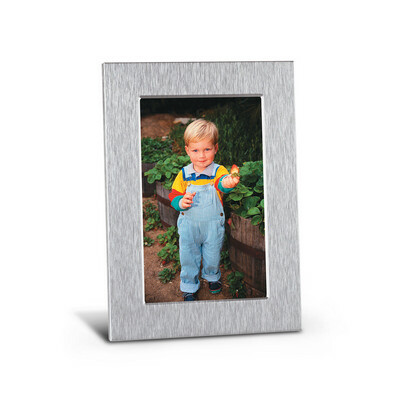 5' x 7' (127 mm x 178 mm) aluminium photo frame that laser engraves to a Natural etch. A lead time of 10-15 working days applies to this product. Colours: Silver. Dimension: W 184mm x H 184mm. Print Description: Bottom - 152mm x 16mm (one colour). Print Type: Screen Print. Packing: Gift Box. Less than minimum quantities are not available for this item. MOQ applies per colour on this item. 4' x 6' (102 mm x 152 mm) aluminium photo frame that laser engraves to a Natural etch. A lead time of 10-15 working days applies to this product. Colours: Silver. Dimension: W 140mm x H 190mm. Print Description: Bottom - 76mm x 9.5mm (one colour). Print Type: Screen Print. Packing: Gift Box. Less than minimum quantities are not available for this item. MOQ applies per colour on this item. 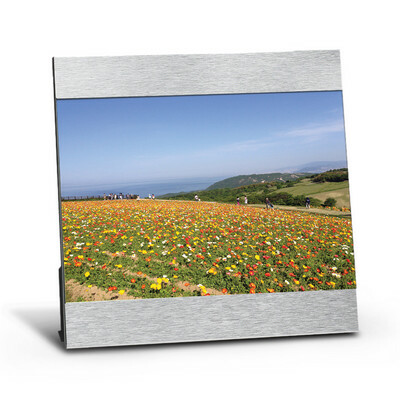 4' x 6' (102 mm x 152 mm) aluminium photo frame that laser engraves to a Natural etch. A lead time of 10-15 working days applies to this product. Colours: Silver. Dimension: W 165mm x H 165mm. Print Description: Bottom - 127mm x 25mm (one colour). Print Type: Screen Print. Packing: Gift Box. Less than minimum quantities are not available for this item. MOQ applies per colour on this item.